It’s early and we haven’t eaten so pancakes with whipped cream aren’t what we’re in the mood for unfortunately, but their menu also has plenty of other brekkie options which are perfect for us. 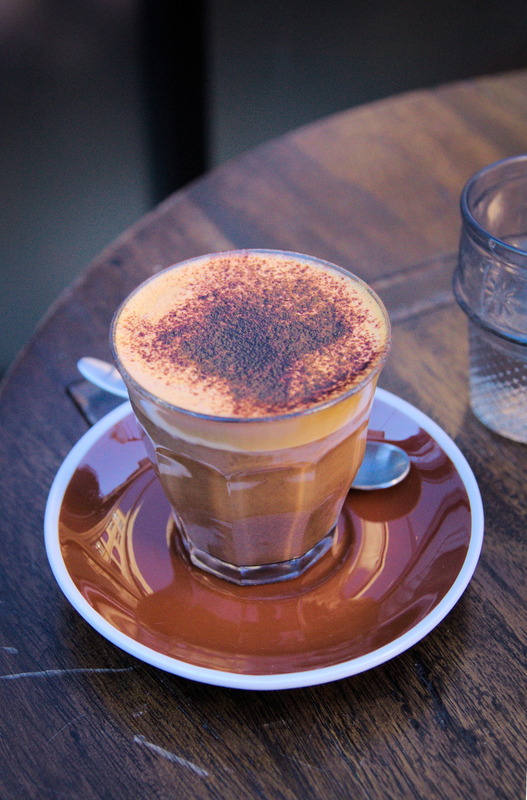 But first, a coffee to warm us up from the cold morning weather! We weren’t able to grab a table inside so we’re slowly freezing from the icy cold wind. 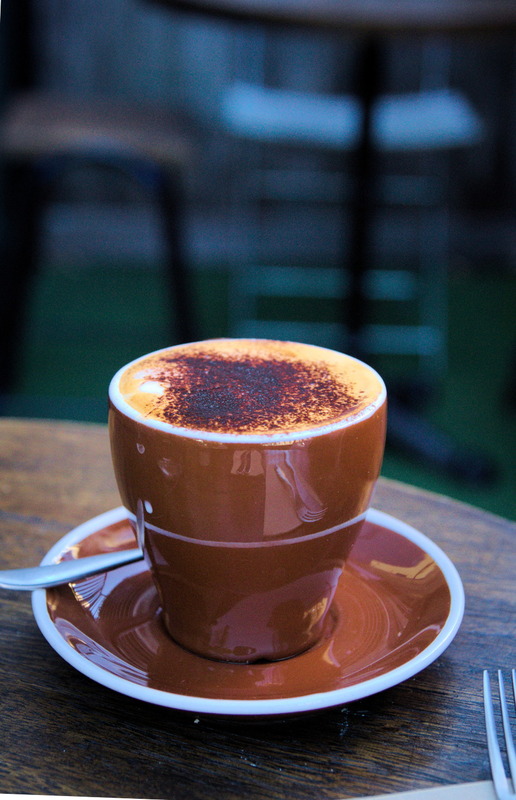 I’m not a huge coffee drinker, although I think I’m drinking more coffee these days, but I did quite enjoy the mocha without having to add any sugar which is always a good sign! 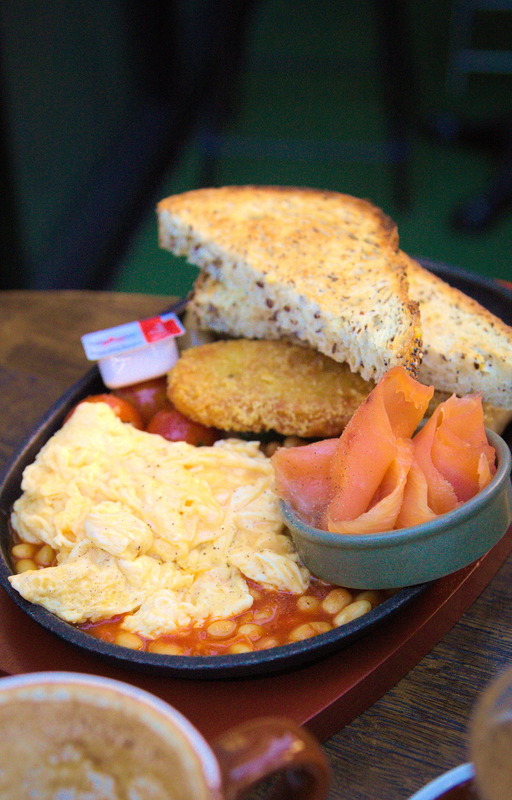 We love the presentation of the English breakfast, and the fact that the sizzling plate keeps everything warmer for just that little bit longer. 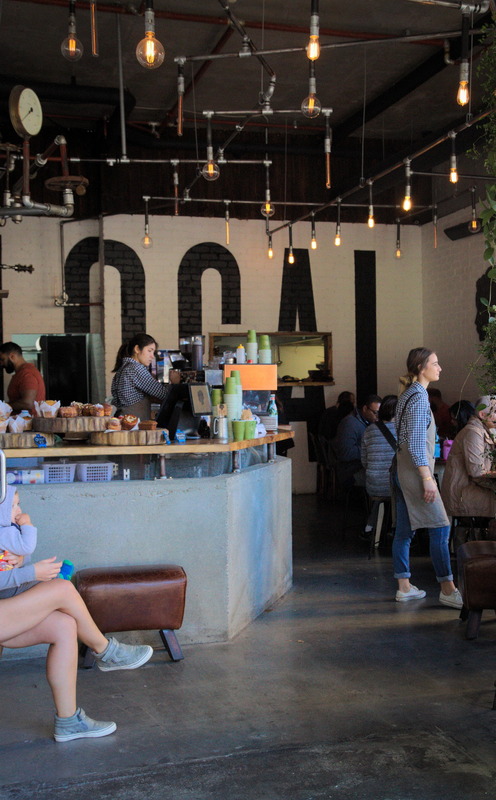 It’s no match for the chilly breeze though, as our breakfast cools down pretty quickly anyway but it’s still a different way to eat our brekkie! We’re quite impressed by the whole breakfast. Though it might not look it from the picture (there’s still about half the dish hiding under the toast! ), it’s a good serve size for a our big morning appetites. The scrambled eggs are soft and fluffy as we like it, and the grilled tomatoes and mushrooms are nice and buttery. I’m usually hopeless when it comes to choosing off menus, but I’m a huge fan of shakshua, and seeing as almost every table had ordered one, the only decision I really had was whether I was going to order the bacon or the vegetarian one. Nevertheless, I did enjoy the combination of veggies in tomato sauce and especially loved the crispy hashbrown that is was served with. We did make a visit the next day to try out the red velvet pancakes, but unfortunately I didn’t bring my camera with me. Not a huge fan of red velvet myself, but my friends loved them, so it’s worth a try! Mocha coffee the love of my life. Can drinks cups without complaining. And the vegetarian dish, loved as well. Great pairing for the coffee. Impressive breakfast sets. 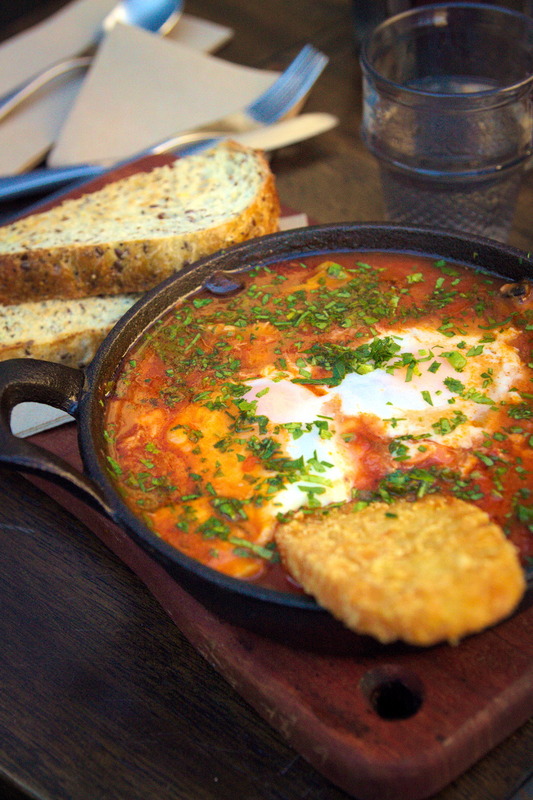 I would love to try that shakshuka.